Good morning! 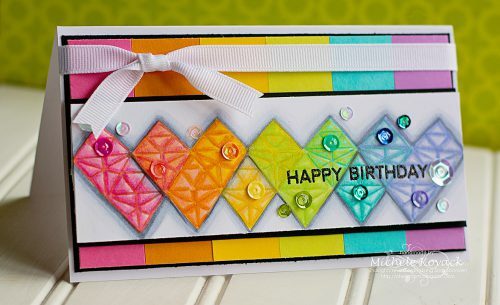 Michele here with a fun, happy rainbow card! I stamped these funky hearts with a bit of masking to make it appear they were stacked over one another and colored them with Copic markers. I stamped my sentiment and matted my panel on black card stock using the E-Z Squares® Refillable Dispenser. Coloring tips: where they over lapped, I used both colors to blend them. Add a grey drop shadow to give it a bit more depth. To match my background with the colored hearts, I cut coordinating cardstock strips and adhered to black paper with E-Z Squares®Refillable Despenser. 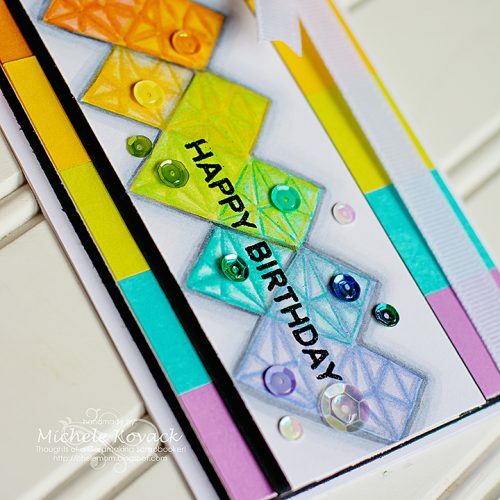 Then adhered both the top stamped piece and the bottom rainbow piece to my card with the E-Z Squares® as well. Tie white ribbon at the top and secure the knot with a Dodz Adhesives Dots Small. I wanted to add coordinating sequins so I used Adhesive Dots Micro under each one. I love using the Adhesive Dots in place of glue! It is so much easier and a lot less mess! 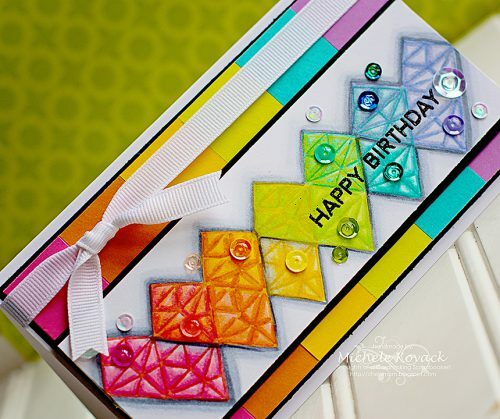 This entry was posted in Adhesive Dots & Lines, Adhesives, Cards, Crafts & Tutorials, E-Z Runner® Dispensers and tagged Adhesive Dots Micro, Adhesive Dots Small, Card, Card Making, E-Z Runner and E-Z Squares Combo Value Pack, E-Z Squares, E-Z Squares Refill, E-Z Squares Refillable, Happy Birthday, Michele Kovack. Bookmark the permalink.